frozen chicken? cream cheese chicken. Put the FROZEN (yes, FROZEN!) chicken breasts into the crockpot. 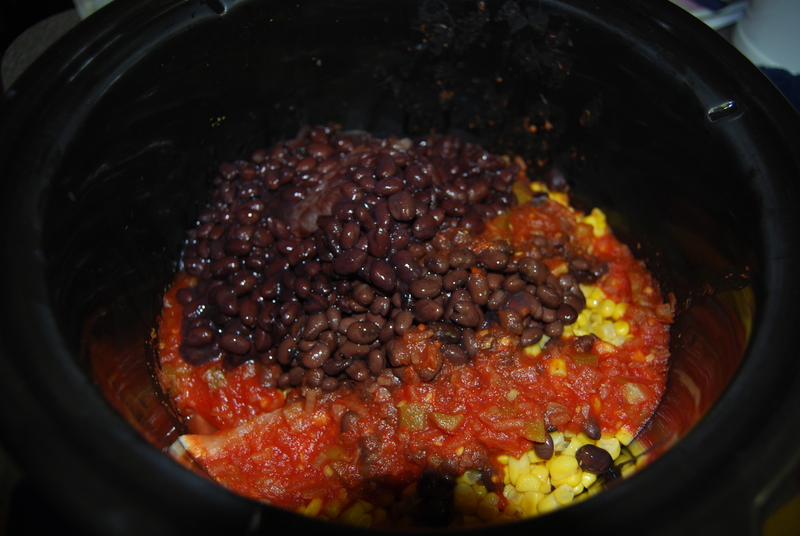 Pour in the (drained) black beans, the corn and the salsa. Turn the Crockpot on high and walk away. Come back in about 4-5 hours. When it’s done, toss in the cream cheese and put the lid back on for 1/2 hour. UPDATE: A GREAT variation: I doubled the recipe except for the chicken and the cream cheese (I have a large crockpot). But this time, we rolled everything up in flour tortillas and made burritos! Next time I either need to use less salsa or maybe just take the lid off and let the mixture stand a little to thicken up, the burritos were a little too runny. But they were GOOD. It does take an extra few minutes to roll burritos after everything is cooked, but it’s still only 5 minutes to prepare on the front end! FirstHusband and FavoriteSon both gave it two thumbs up. Over at www.recipezaar.com it has a total of 480 reviews with a total rating of 4 1/2 stars. Take a look at the reviews to see variations suggested by those who have tried it! My other variations? I had to leave the house after two hours, so I cooked it 2 hours on high, 6 hours on low. I’ve never made it with fresh or thawed chicken breasts, so I don’t know how long it would take, but I’m thinking the LOW setting for sure. Also, my serving didn’t have the cream cheese in it and I still liked it! The chicken was SO moist! Click Here for a print friendly version in PDF! I am so going to have to try this! I love anything with salsa and frozne chicken sounds so easy! I’m so printing this out–ANYTHING with cream cheese in it is a hit in my book, and salsa too? Yum, yum!